Yup, that’s the last bonus strip. I hope you’ve enjoyed them! They were fun to do, but, Phew! The extra work was intense! Have a happy 4th of July, fellow Americans (sorry about that, Britain). Drink moderately and drive responsibly! I absolutely love Gurf in the silly comic! This is your best one yet. “Paul”? And you are not nearly so imperious that He would address you so. (though Chris is a top-notch professional, he is also a really nice guy, and would have his cast more at ease than that) So, who is the rest of the cast and have we seen their work before? Very elegant solution to the Draak-Sim problem. I just got to thinking: why would the controls to activate (or deactivate) the Draak-Sim only be on ‘our’ side? Does this imply the Pan-Universal Geniuses were from our universe? One wonders if they had a form of daylight spending/saving time revolving around the revolver. @VincentG. Christopher doesn’t say they’re ONLY on ‘our’ side. It could be on both but once deactivated, it cannot be reactivated. Or he sabotaged the other side’s to prevent them from activating it, thus our deactivation end it for good. Christopher; nicely done explanation of the Draak-Sim revolving door appearance. Where does it say these things? How do you know that only two universes are involved? People advise to avoid time travel themes because there lie headaches, but you could say the same for dimensional travel and the logical absurdity of “alternate” universes. Another good point for avoiding the writing of a never-ending storyline. @Mummpizz & @Jediadept, suggested by @KQY in the previous strip’s comments! An awesome suggestion. The business with the draak-sim and timekeeping somewhat reminds me of the meter being officially redefined in terms of the speed of light (and vice-versa). This bothered some people, due to the length of a meter now being defined by the limit of our capacity to measure the speed of light, and thus officially subject to “change” as the accuracy of our measurements improves. Eh, serves them right for basing their system of timekeeping on pan-dimensional constants instead of good old-fashioned dimensional constants. 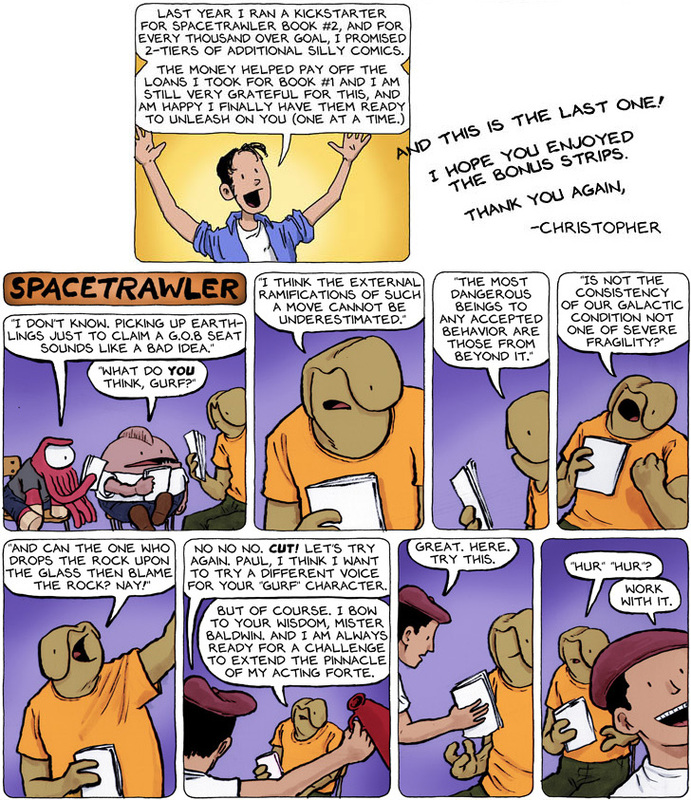 Thank you very much for the bonus strips, Chris. The length of a meter (and any other length unit) has *always* been defined by the limit of our capacity to measure some standard, and thus officially subject to “change” as the accuracy of our measurements improves. Very much enjoying the bonus strips. Hear hear! @stevegallacci, I read Paul’s attitude in the bonus script not as subservient but a sort of verbose comment that people sometimes make to their friends, sort of “hamming it up”. Zing! I *love* it when Nogg turns a burn into a reverse burn! This comic has made me laugh out loud more times I can count, Chris! Thanks for sharing it with us! Will buy book three when it comes out! This insanity must be rewarded! Ada, you are likely correct, as I may have been a bit too defensive of Chris’s character. He really is a fun, great guy in person, so harass him mercilessly at any public apperence. Sorry for the late response, but I’ve noticed comments here about bonus comics and this one says it’s the last bonus comic – are the bonus comics now archived somewhere else? Or only available in the print editions? I’m reading this in 2017 (obviously), and there’s no bonus strips or links to them showing on the page. I would really love to read them. @Kit, huh. Tells you how overloaded I get sometimes: I have no recollection.